I don’t need to tell you that the United States has reached a political crossroads. We face threats both domestically and abroad, yet our leaders in Washington are failing us at every turn. 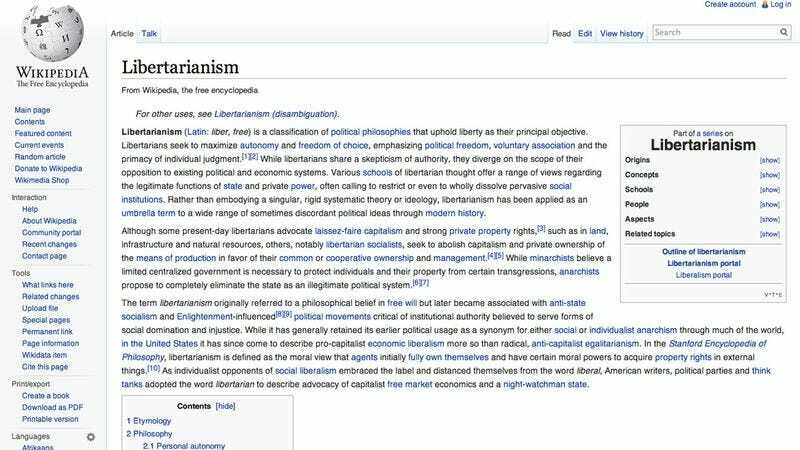 I used to think that this nation’s problems could never be solved, but then, while browsing the internet, I came across the Wikipedia entry for libertarianism, and I only had to read half of it before I became completely convinced that it is the political philosophy America needs right now. Even the title of the Wikipedia article was convincing. When I saw a Wikipedia entry called “Libertarianism” with the word “liberty” right there in the name, my first thought was, “This looks promising.” And I was not disappointed. Not even a sentence into the general overview section of the article, I learned that libertarians value liberty as, and here I quote directly from Wikipedia, “their principal objective.” Case closed. I knew at that moment that this is what America needs. After reading roughly 50 percent of the article, I was 100 percent on board. I became convinced that libertarianism is the only way forward for our nation. Did you know that libertarians want economic prosperity while allowing individuals to operate autonomously within the free market? That’s the best of both worlds. If you can’t see that, then that’s your problem. I will not and also cannot explain it any further. After reading roughly 50 percent of the article, I was 100 percent on board. You have to admit, it takes a pretty powerful ideological stance to completely win someone over after a few short sentences on Wikipedia, but libertarianism is something special. All I needed was a cursory, surface-level understanding of it before I was ready to completely devote myself to becoming a vocal advocate for what I gather are its core principles. I now make as many Facebook posts as I can about how big government is dangerous, and how libertarianism can help shrink the government so that it becomes small instead of big. I also conscientiously post context-free quotes from libertarian television character Ron Swanson, from the sitcom Parks And Recreation, in order to further drive home my point. I like to think my arguments are pretty convincing. Yet no matter how many Facebook posts I make, many of my friends have failed to embrace the tenets of libertarianism. If they knew even the tiny amount that I know about this superior political philosophy, they would almost certainly share my belief in its ability to move America forward. The first few sentences of the Wikipedia entry for libertarianism should be required reading for all American citizens. Those few short sentences will completely change their lives, the same way they changed mine.